Happy (almost) New Year, friends! We’re now just three days away from kicking 2016 to the curb and welcoming 2017. Maybe, like me, you’re feeling a strange mixture anticipation and hesitation about what’s ahead. So many unknowns, and with “unknowns” comes a sense of apprehension and loss of control. I get it, and I happen to hate that out-of-control feeling. Probably because the truth is that much of life is, in fact, out of our control. But what if there were a couple things you and I could do to help anchor us in the new year? I’ll get to that in the minute. But first, a story. Two months ago, I took a long-anticipated trip to Grand Rapids, Michigan. After three years of working with Zondervan Publishers over email and phone, I finally had the opportunity to travel to their corporate office and meet face-t0-face the team of people who helped make Undone: A Story of Making Peace With An Unexpected Life a reality. As many of you know, Undone released in the thick of my treatment for cancer. In fact, I was far too sick to participate in the weeks before and for months after. Although I’m convinced God alone made that book fly, I also owe the team at Zondervan (as well as my own rockstar launch team) a deep debt for all their wing-flappin’ in my absence. I’ve been waiting for years to hold their hands, look in their eyes and say “thank you.” What a gift to finally do just that! But it gets better. The purpose of the trip was to record ten new videos for the upcoming release of my second book, I Am: A 60-day Journey To Knowing Who You Are Because of Who He Is. Anytime I’ve given the opportunity to speak, it’s a strange mix of loss and redemption. This time, however, the predominant emotion was nothing but gratitude. If you and I are connected on Facebook or Instagram, you had a front row seat for the full-circle moment. What I didn’t expect on this trip, however, was that God gave me a renewed passion for writing and speaking. I confess. Sometimes I look at the millions of books on Amazon and think the last thing this world needs is another book. Why in the world am adding my noise to the mix? But spending those three days contemplating I Am and THE I AM renewed my love of words. We need fresh messages, relevant insights, new voices, alternative perspectives. There’s something powerful about words and the various ways we can use them, written and spoken. Especially when we’re shining a bright light on the presence and purposes of God. The Communicator Academy Podcast: Quite some time ago, my good friend Kathi Lipp asked me to consider doing a podcast with her. There’s so much to love about Kathi: her integrity, selflessness, business savvy, hope-filled messages. I knew I’d enjoy partnering in business as well, but the timing wasn’t right. Until recently. That’s why I’m thrilled to announce that I’m now co-hosting the Communicator Academy Podcast with Kathi Lipp. Communicator Academy is a podcast designed to encourage and equip you to be the communicator God made you to be. In short, this podcast is for anyone who wants to learn all the ins and outs of being a writer and speaker. Our goal is bridge the gap between your dream and your destination. Many of you have a powerful message. You know you want to speak more, maybe write a book or start a blog. But you need some direction, a friend in the biz who can help coach you along the way. That’s what we want to do for you. You can get more information and subscribe here. The I Am Video Experience: Are you exhausted of trying so hard to do more, be more? Are you weary of killing yourself trying to get it all done, and yet still feel like a failure at the end of the day? If so, then this series is for you. 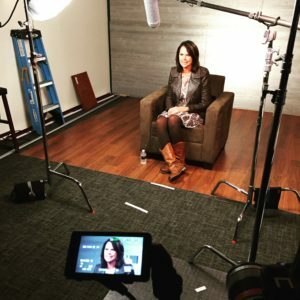 This is the video series I shot while at the Zondervan Campus in November, and let me say the taping UNDID me. God has been working on my insecure heart for years, but he upped his game in 2015 and 2016. Then, when taping this video series, he whacked me upside the head again. 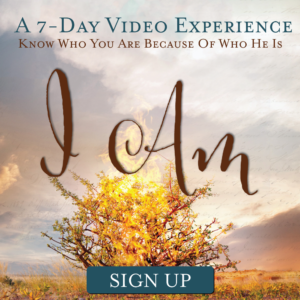 In short, The I Am Video Experience is a free, one-week video experience that delivers daily, 4-5 minute devotional videos right to your email inbox. Although I give an overview of the I Am book (releasing 1/24! ), it’s not required for the video experience. Simply, it’s my gift to you, a way to help you know you’re not alone. Besides, the new year is a perfect time to anchor your identity on something that isn’t based on whether or not you keep your resolutions. That’s it, friends. A podcast to help you thrive in your calling and a video experience to help you pour solid cement underneath who you really are. Have I mentioned? You were one of the best gifts of 2016. I am really enjoying the video series and I am thrilled about your new podcast. It’s right up my alley. Writing and speaking. Two things that I have tucked away in my heart for quite some time now. I’m not sure how it will all come together but I am currently a sponge soaking up all the information and utilizing all the resources that I can get my grubby little hands on. 2017 represents freedom for me. Freedom to begin again. To continue to draw closer to God as I go through my trial of lymphoma in my brain and to be bold in letting others know how God has blessed me even during this horrific trial. Goodness. I’m so sorry for all you’re enduring, Lisa. It’s too much. And my heart aches for you. Your determination to press on and focus on our good God is inspiring. Press on, friend. Keep for fighting for joy! Michele, thanks so much for allowing me to be part of the launch team! I read ahead because I am presently on vacation. The videos were so encouraging! I would love prayers over my writing. I struggled all last year with it. My husband lost his job this year at 64 and though he has retirement we are looking for what God has for us next. We have wondered, contemplated, received advice, but no answers yet. Thanks so much for your book! I just watched the interview (both) you did with Colleen Swindoll Thompson and it was so inspiring. So much of what you said resonated with me. I have been walking with God through pain and suffering for several years now (yes, I enjoyed Timothy Keller’s book so much I filled a complete notebook with my thoughts and feelings) but it is always encouraging to listen or read about others who have been on or are still on this crazy path. Walking through (more like stumbling) this journey of suffering can be difficult for so many reasons. The physical pain is hard enough to deal with and the isolation is just as heartbreaking, but wandering around in the wilderness hoping to feel His embrace, hear His voice or just know He’s still there is beyond anything I thought I’d ever experience. Although I don’t have any doubts about my faith in Him and I’ve learned to trust Him completely with what I cannot control I am still challenged by the lack of connection I’m feeling with Him. It’s definitely a desert experience. It is sad that so many find it uncomfortable to walk alongside those who suffer and it’s true that our Westernized culture seems to somehow shelter us from the realities of hardship and heartache, but I do agree that if we took your reference to 2nd Corinthians 3 seriously and Matthew 16 as well we might see more support for one another. I also appreciate your sharing of what the true definition of the word “comfort” truly means. Wow, how interesting and enlightening. Thanks Michele for opening up your life so that others may find the comfort you received from Him. I’m looking forward to reading your new book and taking the challenge for 60 days. God bless you!